As a beginner, choosing a guitar can be difficult. How do you know what to choose if you are not sure what you need? How does a beginning guitar player decide what features they want in an instrument they have not played very much? There are so many options it can be confusing. Do you need an acoustic, classical, flamenco or a beginner electric guitar to start with? Are you planning on playing solo? Or will you plan to join a group at some point? There are so many types of instruments including six-string, twelve-string, or a bass guitar that it can be difficult to know which is the best beginner guitar. To add to the confusion, you may see a related instrument like a ukulele or a mandolin. Then of course, you will see various versions like the electro-acoustic guitar and the acoustic-electric guitar.It’s not always feasible to consult with experts and you may be unfamiliar with names like Gibson or Fender. I am a professionally trained guitarist who’s been playing for over a decade. I have personally tried different types of guitars. I have reviewed a lot of these guitars, watched YouTube videos and compiled a list of some of the characteristics you should look for when making your first purchase. Knowing about these different types can make finding the best guitar for beginners a lot easier. I am happy to recommend a few guitars that are eligible for your new musical adventures whether you desire to play professionally, taking online guitar lessons or are looking for your first instructor. Out of the five basic types of guitars, what do you need? The acoustic and electric models have steel strings. Both the flamenco and classical instruments have nylon strings. Also worth noting is the fact that instruments which have steel strings have narrower frets than guitars with nylon strings. Frets are the tabs, or spaces measured out on the neck of the instrument. These are the basic differences, but what does that mean? Guitars with thinner fretboards can be more difficult if you are learning f﻿ingerstyle playing and methods like scales or a specific guitar trick. This style doesn’t give adequate place for your fingertips. Instruments that have a narrower fretboard will be more functional for those who use a plectrum. Acoustic or classic for a beginner’s first guitar? Guitars with thinner fretboards can be more difficult if you are learning fingerstyle playing and methods like scales or a specific guitar trick. This style doesn’t give adequate place for your fingertips. Instruments that have a narrower fretboard will be more functional for those who use a plectrum. For intermediate or advanced level fingerstyle playing, the plucking hand will need fingernails. For those plucking the strings, the better selection is a classical or flamenco guitar as they have nylon strings as opposed to metal ones. It is difficult to pluck steel strings using fingernails as they can chip and crack. There are a few who have mastered this technique though. For instance, a famous Australian guitarist, Tommy Emmanuel plays an acoustic guitar with steel strings and uses fingerstyle plucking. He’s received a nomination for the best player in the world numerous times. Guitarists who play classical and flamenco ﻿﻿music use a different type of string plucking. It incorporates a lot of what’s called a rest-stroke. The strings on an acoustic guitar are too close to each other to allow a place for the resting fingertip necessary. On the other hand, playing using a banding technique is nearly impossible on nylon strings. One of the basic techniques is string bending. This move is used frequently when playing blues guitar as well as rock, but is also found with many other styles. The string is bent” by pushing it so it gets tighter. This changes the sound of the string. Since nylon strings do not have as much tension, it is difficult to change the pitch with this type of technique. This is the primary reason this method isn’t used on a classic or flamenco guitar. The specific sounds of the steel strings found on electric, acoustic and steel-string acoustic guitars are designed for some of the most popular genres. Usually, they work well with genres like rock, pop, blues, folk, country and jazz guitar. A classical guittar is designed to play classic style tunes only. Flamenco music can be played on the classical style guitar, but it will lose a lot of its crisp, tones. There are some effects obtained with an electric guitar that you just can’t achieve with the acoustic style guitar. An electric guitar has the advantage of sounds like sustain, or distortion. Some acoustic guittars contain a pickup so they can be used with an amplifier, but you’ll not be able to duplicate the sounds of an all-electric guitar. Acoustic or classic for a beginner’s first guitar ? After considering the options above, think about the various buying options for acoustic guittars. Statistically, a beginner guitarist who feels more competent about their musical capabilities and tastes choose classical music over other styles since it requires more practical and theoretical work. Ultimately, for those who prefer classical style music, let’s look at some of the best classical product buying options. We’ve chosen the five best guitar buying options for beginners looking for an acoustic guittar. There is a wide price range in prices and differences in quality, so the comparison is rather broad. But you can look at some of the best options for beginners. ​All the guitars are 4/4 dreadnought size except for the final one which is a bit smaller than the other models. This dreadnought size is the best for an acoustic guittar as it will yield the best sound quality. The Jasmine S35 is the least expensive instrument we bring to this beginner’s buying guide. It is designed specifically for the new musician. This inexpensive guitar makes a great practice instrument. Using the adjustable truss rod, players can set the action to their preference, skill level and finger strength. The adjustable truss rod helps keep the fretboard from becoming deformed due to tension placed on it by string tension. This is a great advantage for guittars in the lowest price range. Takamine, a popular guittar manufacturer, makes the Jasmine S35. Like Yamaha, its headquarters are in Japan which helps keep the price tag budget friendly. The strings on the guittar at the time of purchase are not the best quality strings. You’ll need new strings and a good tune-up by a person who knows what they are doing. ​One reason this model is inexpensive is that it’s not very durable. It’ll show some wear and tear over time. While this is a great beginner’s guitar, it’s not one you will want to choose for your lifetime guittar. It will not be the last guittar you play. But once you are certain of your commitment to playing the guittar, you can get a more expensive one. With that being said, it is an excellent acoustic guittar for you to start with and see if guittar playing is something you want to continue to do. There’s no doubt the Yamaha FG800 is produced by one of the greatest brands. This is a great choice for beginners. It is definitely one of the best acoustic guitars found on Amazon. This full-size guitar is reasonably priced for such a high quality solid wood instrument. Usually, entry level guitars are not made with this top quality. Engineers at Yamaha studied acoustic sounds and looked at how to achieve the best sound possible. A lot of thought and planning went into this model. Deep analysis led to the development of a new bracing pattern built by scalloping. This is a newer assembly that helps to maintain the top board’s durability without sacrificing the great sound this Yamaha has to offer. The unique quality of the Yamaha FG800 is that the sound it going to continue to improve over time. ​You’re going to get a lot of quality sound at a very low price. As you improve your playing skills, your love for the Yamaha FG will grow as well. Although beginners will love this model, it’s one that will serve musicians for a lifetime. This guitar bundle has several accessories including a clip-on guitar tuner, key winder, a capo, strap, extra picks and a pick holder. It also comes with folk style strings and an instructional DVD to get you started. You won’t see many setup kits like this one! Take a close look at the Epiphone Hummingbird Pro and you’ll see similarities to Gibson’s Hummingbird model you may have seen in a magazine or online. This is basically the affordable version of the famous Gibson guitar. The front of the guittar’s body is solid spruce and the sides are constructed of coated mahogany. It’s not only beautiful to look at, it sounds amazing! It has a nice well-rounded sound that echoes perfectly for the listener’s enjoyment. The 20-fret fretboard is made from real rosewood and the slim d-neck is constructed from mahogany. This look and feel makes this a great option for the beginner player. Constructed out of rosewood as well, the bridge contains the six pins and the synthetic bone saddle. It comes equipped with a Grover tuner and a tortoise pickguard. The Hummingbird Pro has a built-in pickup along with a Shadows ePerformer pre-amp system. This allows for quickly connecting it with a PA system or an amp. The preamp unit uses a 9-volt battery, includes treble and bass controls for tone as well as a master control for volume. It is important to note that the batteries will drain quickly if the guittar is left plugged in. Changing the batteries is a little difficult for some. Ultimately, you’re not going to find a better guitar for a beginner to get started on. It’s super easy to play, has a warm tone, and it is loud and clear. You can use the pickup and pre-amp system to amplify it and still maintain its outstanding high-quality sound. The primary difference in this product and the others already mentioned is that it has the acoustic-electric option due to the built-in pickup. If you want a high-quality wood guitar, the Seagull S6 is a great choice. The top is constructed of thick cedar and the back is made of wild cherry. This unique combination creates a bright sound that has a mid-range tone that is easily projected. A tapered headstock helps it hold a tune for longer. Silver leaf maple is used for the construction of the neck which is overlaid with a rosewood fretboard. This is ideal for guitarists who prefer fingerstyle playing. The wider neck and nut offer more action – which is also adjustable. If you will predominantly be playing guitar chords, this product will be a little more difficult to play. The Seagull S6 is constructed to serve you a long time. You will definitely get what you pay for, it’s quality construction and durability are worth it. One of the unique qualities of the Seagull S6 is the cherry wood used to construct the back and sides. However, you will need new strings as the one that come with this product are not high-quality. The primary difference this choice offers over others is that it is made of some of the highest quality wood available and it is crafted by American artisans. This is a good choice for a beginner who is certain they want to play at a higher level. It looks great, feels great, has a good fret size and an adjustable action. It gives an entry-level player the opportunity of getting a premium feel. It is out of tune when you receive it, so it can be difficult for a beginner who is uncertain of how to tune a guitar. For kids who are trying out guittar playing, or for the smaller player, the Yamaha FS800 is perfect. Don’t let its small size fool you though, it has a nice tone that sounds about like the Yamaha FG800. It just has a smaller sized body. It’s a great deal for the beginner as it comes as an entire bundle. You’ll get a gig bag, strap, tuner, instructional DVD, extra picks and strings and a cloth for polishing. It is well worth it especially if you’d like to surprise someone with it as a gift. Best of the best: When you consider quality and price – the absolute best deal is the Yamaha FG800. It’s perfect for the new learner. If it turns out to be a passion, then upgrade to a more expensive guitar. For starting out, save money on the guitar and spend the extra on instructions, music books or new strings. Good quality and low price : If the beginner is not sure of the style of music they want to play or even if they will play the guitar beyond the beginning stages, the Jasmine S35 is the best choice. It’s inexpensive, but still a decent instrument as it has all the desired features of an acoustic guitar. Smaller guitar : If the beginner is a child, or a small adult, the Yamaha FS800 is perfect. With this model, you are not giving up any sound quality for the smaller instrument. It’s a good price, a great sound and perfect for short or small individuals. However, if you are certain you will want to amplify it at some point, you may want to invest in the Epiphone Hummingbird Pro. It is great for the students who are not sure which style they will prefer when they reach the intermediate level of playing. Seagull S6 is also very good for these students, but with an additional value – it can last for so much more because it is a very good guitar. It is always better to have one excellent guitar then two solid ones. Now we’ll look at five classical guitars. We have limited the selection to six-string rather than twelve string guitars since these are better for beginners. In this style, there isn’t a smaller size since the classical guitar is typically smaller than full-size acoustic models. Since they run smaller, there is no need to look for a smaller one for adults. The next five products selected are the best of the best. They are listed by price range so you can compare features. Yamaha has long been known for providing quality guitars for the entry-level player and for the school niche. The C40 Classical is a great choice for the beginning classical guitarist and has done well market-wise. The C40 comes with an instructional DVD, extra strings (not the best strings out there), a polishing cloth and a pick card. This creates a nice starter pack. The sound of the C40 is what you would expect in this price range. The neck is constructed from nato, the fingerboard from rosewood and the tone woods are laminates. Although this combination gives a slightly muted sound, it is decent and isn’t a typically a problem for this audience. Despite this small drawback, the C40’s tone is pretty warm and well-defined. ​Solidly constructed, and lightweight, the C40 from Yamaha seems to be built to last. As is typical with classical guittars, the fingerboard is wide with lots of space between the frets. You may have to stretch a bit to play this one. It has the classic shine that is expected with a guittar, seems to attract fingerprints but it has a refined, somewhat expensive look. The frets may need to be replaced since they seem to be a little less than perfect. Cordoba offered us the perfect example of a beginner’s guitar in the C3M. It has a great look and feel, especially for the classical guitarist who is just starting out. The body’s beautifully finished so it feels light to touch and looks like satin. It just feels like a high-quality guitar. Not only is it sturdy, it has a great sound, especially for the price. Manufacturers have not disappointed the population who have come to expect this top-notch quality, one reason they’ve become so popular among musicians. As for looks, the mahogany back and sides complement the cedar top. This meets what has come to be the highest in industry standards. The 19-fret fretboard is constructed of rosewood, the neck of nato wood and together they stretch for 25.6 inches. The lightweight, metal truss rod is embedded and two-way adjustable to a 4mm difference. This just ensures the longevity of the instrument and guarantees long-term use. It’s quite a bit less expensive than some of the higher quality models, but contains the perfect wood combination to ensure perfect resonance and a great sustain that is preferable in classical music. The C3M sounds just as good as a lot of the higher priced guitars. Its resonating, rich tones can fill the room with relaxing and enjoyable music when played with skillful hands plucking a nylon string. The instrument is rock solid, looks high dollar, is precise and easy to handle. It performance will not disappoint. Some buyers have reported a loose bridge and a loose neck. These are easily adjusted and can be properly setup so you can enjoy playing this guittar. At first glance, the CG122MSH looks just like the C40 by Yamaha. But once you look a little closer, you’ll notice some distinct differences. The C40 is obviously designed for beginner or school use to learn the basics on, but the CG122MSH is more refined. It just feels like it’s made for the higher-level player. To start with, this choice looks great! But the more you look at it, the more you’ll see how much attention Yamaha gave to the small details. The decal around the sound hole, chrome tuning gear and lots of other small elements make it look classy, elegant and expensive. This guitar’s matte finish is gorgeous and makes the musician proud just to hold it. Its construction is mostly nato, but the fingerboard is created using rosewood which adds a nice touch. The top of this guitar is solid, wide grain Engelmann spruce. This top is not even comparable to the laminated top, you’ll see it’s all the difference in the world. It produces a clear, more robust sound compared to what you’ll get from the Cordoba C3M. It’s got a little bass, robust mid-range and dry high-end sound. As far as the fretboard, it’s a standard 19-fret, slightly wider neck when compared to other acoustic style guittars. It also has a low action. This is great for people who have larger, chunkier fingers as it gives some additional room. The only downside is there isn’t a truss rod, so there’s no way to adjust the action. Additionally, the 19th fret is not usable due to the position of the sound hole. Also, some may prefer normal strings for this guittar rather than the ones that come with it. 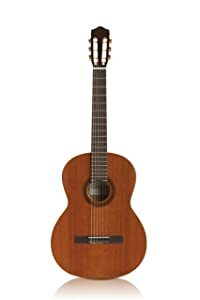 Cordoba is relatively new when if you compare them to other classical guitar manufacturers since the company was only founded in 1997. Even though they entered the market later than other companies, they have managed to have a big impact with their fine products. The C5 is one of the most recent Cordoba instruments in the entry-level classification. The Cordoba C5 comes with a bundle which includes a deluxe gig bag, Cordoba tuner, classical strap, capo, and a polishing cloth. The package is designed to help you maintain the guittar for long-time use. The C5 is kind of like having the best of two worlds. The body is constructed of Iberian mahogany, and nicely complemented with a Canadian cedar top along with a rosewood fretboard. These three come together to make the perfect combination and feels great to play. The instrument is light, and the headstock is designed to hold a tune for some time. Constructed on the Iberian Peninsula, the model comes with a classical sound that would be expected from a “Spanish guitar.” It produces a warm tone and is relatively loud for a classical style guittar. If you want more volume, you’ll need to use an amplifier. The nylon strings that come with it are not the best, and you’ll probably want to buy new ones soon. As per some people’s taste, some may not prefer the high-gloss finish, but that’s a matter of taste. Takamine may not be some people’s first choice, but some very popular musical artists use this brand including Toby Keith and Bon Jovi. With that in mind, the GC5CE-NAT is not disappointing. It is well-built, great looking and precise. The neck is constructed of mahogany. The fingerboard, back and sides are made of rosewood and the top is solid spruce. Heads are gold-plated and a stylish Venetian-style cutaway. It also comes with a lifetime warranty. The guitar has a built-in tuner. Overall, it’s not a bad choice for entry-level players. The Takamine includes a hard case which provides additional protection from damage during transporting. The sound hole is surrounded by a beautiful mosaic rosette which is very complementary to its overall look. Of course, it’s important to note that all these shiny details also mean it’s prone to fingerprints. So, it’s kind of good – and king of bad. It may also be less attractive to those players who are not flamboyant musicians. The 18.5 fret fretboard has great action and allows for free movement up and down while playing. It comes with a TP-4T preamp unit that contains a built-in tuner and a master volume. This product provides a clear, sharp and loud sound whether or not you are using an amplifier. Even though it’s made in China, it has a distinct “Spanish” sound to it. The GC5CE-NAT is made of great quality and is a good long-term investment. Some people find the name confusing and think they are getting a full sized guittar, but it is a smaller, classical version. Best of the best: Hands down the Yamaha CG122MSH. It’s great quality for a good price. It’s a good guitar for the beginner as well as intermediate players. Good quality and low price: the Yamaha C-40 wins this category. It’s the best option for a beginner classical guitar. The C-40 is excellent for beginners and provide quality playing long into the intermediate levels too. If you are passionate about playing classical guitar, a good choice is going to be the Cordoba C5. But the Takamine G-Series is better if you can afford it. It’s important to get a high-quality guitar no matter what type of music is going to be played. Main characteristics of a good guitar for a beginner ? Note : The action of an instrument plucked by hand is the distance between the fingerboard and the string. What do you need to check when receiving your guitar? Look at the gap between the fretboard and the strings. If there is too much space, it can make it difficult to play. If there isn’t a lot of space, the strings touching the frets can create noises when you are playing. If there is a glitch, you may damage the instrument more by trying to fix it yourself. Contact the seller, or go to a music store for an experienced worker. Final advice for beginners ? Don’t buy a cheap guitar. The quality of the guittar does affect how it sounds and how it plays. Some techniques are more difficult on a cheaper one. It’s best to save your money until you can buy a higher quality instrument. It’ll be safer for your hands and improve your playing efficiency. Listen to the sound of a guitar before you make your purchase. Make sure it’s the sound you want. You can also have a friend listen with you for some additional input. Read this review, and other reviews by those who have experience playing guitars before you choose what you want to buy. The soundboard’s appearance doesn’t affect the sound quality of the guittar. Finding the best guitar for beginners can be daunting. Today’s competitive market can complicate the process. After reading through this review, you’ll have clearer information to work with no matter what guitar method you want to learn. You won’t regret it if you chose to purchase one of these 10 guitars. But read the review thoroughly before making your purchase so you ensure you get the right guitar for getting started. The best beginner guitar for you is out there for sale - you just have to find it.